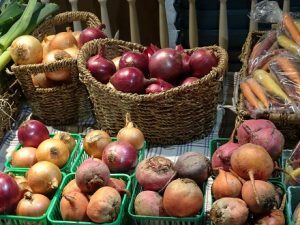 The Stratford Slow Food Market, in Stratford, Ontario, offers local foods, drinks, and crafts, year-round. 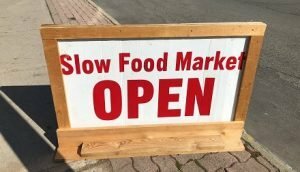 Slow food markets are a way of saying no thanks to the rise of fast food and fast-paced lifestyles. 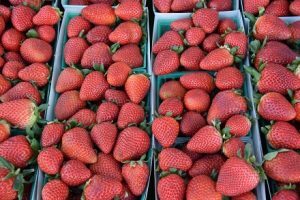 They facilitate eating locally and seasonally, taking time to enjoy simple pleasures like chatting with your neighbours and your purveyors while selecting your supplies. In the tradition of the slow food movement, at the Stratford Slow Food Market you won’t see transport trucks delivering goods from far away places but you will see owners of family-run businesses unloading vehicles that do double duty, transporting kids to hockey games and school. 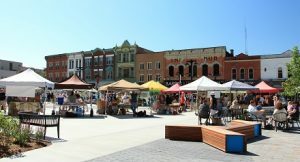 From mid-May to October the Slow Food Market is held outdoors in Stratford’s downtown Market Square where a variety of vendors set up their umbrellas and display tables across the expanse of decorative paving stones. In the shade of the many-coloured canopies, you can select your fresh vegetables and fruit. Bright red stalks of rhubarb. Crunchy green asparagus spears. Freshly picked tomatoes and cucumbers. 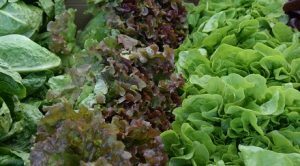 Numerous varieties and shades of salad greens as well as strawberries. You’ll find product displays and handmade crafts. Water jets embedded in Market Square invite kids to cool down in the hot sun. The shops in the surrounding Victorian buildings set out signs to announce their specials of the day. People wander, or sit on the outdoor furniture, with cups of coffee and cold drinks. Neighbours and families meet up and get caught up while visitors to Stratford pick up breads, meats, and cheeses for picnics along the Avon River. Buskers entertain on the street corners. In the winter months the Stratford Slow Food Market moves two blocks north on Downie Street to be indoors at the Festival Square. You’ll find fewer vendors there, in a smaller, more intimate space. 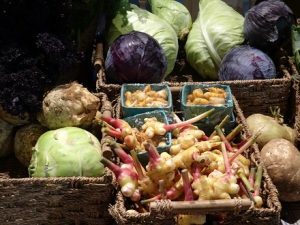 Shoppers fill their environmentally friendly bags with richly-coloured and deeply-flavoured fall and winter vegetables. Beets, kale, celery root, parsnips, eggplant, and leeks. Jerusalem artichokes and rainbow carrots. Spices like turmeric, garlic, and ginger. 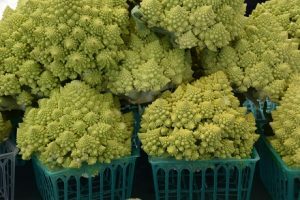 At this colder time of the year, even though some of the produce is not the prettiest because it is not waxed or polished like those on display in large grocery stores, loyal customers line up to be sure to get their favourites. Soiled Reputation and Loco Fields offer vegetables. 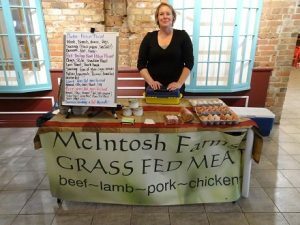 McIntosh Farms bring in meat, poultry and a choice of eggs – white, brown, and duck-blue. 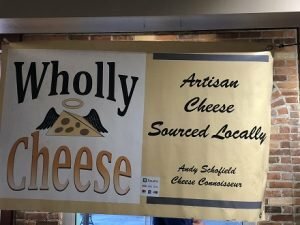 Wholly Cheese provides samples of their aged, herbed, and smoked cheeses. 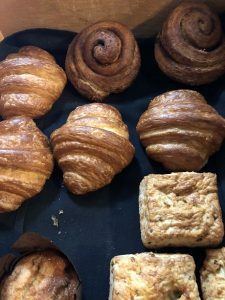 You can purchase breads and croissants from a baker who loves to take the time to explain the best way to enjoy his naturally-leavened seven-grain loaves, crusty baguettes, and focaccia. 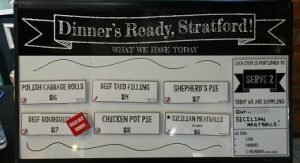 For those who do not want to cook, Dinner’s Ready, Stratford, is the answer with frozen meals for two. For condiments, Pickles Eh and Harvest Moon Trading Co. supply home-canned goods like chutneys, jams, curried cauliflower and pickled onions. At the Pillitteri Estates Winery table you can sample a red or white or ice wine, before you make your purchase. 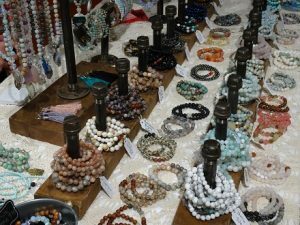 Other vendors, who also don’t mind traveling in the winter weather, display their jewelry, lotions, soaps, and crafts. 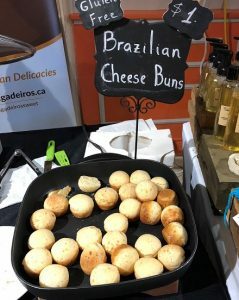 And there are always new products and surprises, like bite-size Brazilian cheese buns or fruit-filled pop tarts. Judy Johnston, from New Hamburg, drives 25 kilometres to Stratford every Sunday morning, even in the winter. “The Slow Food market offers real food, interesting food, that we are excited to eat every week. It never gets pushed to the back of the veggie drawer and forgotten,” she said. 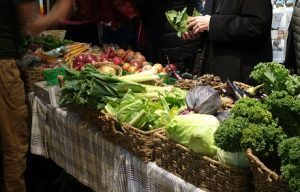 The Stratford Slow Food Market, no matter what time of the year, creates an opportunity for you to slow down, to discover and enjoy local drinks, crafts, and nutritional, seasonal food. 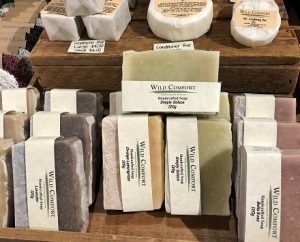 As you leave the market, with your shopping bag on your shoulder, to head off down the sidewalk or to load your precious purchases into your car, it’s good to know that you are supporting local producers.